A big part of personal growth involves money and financial freedom. I have written about personal growth categories in the past and money falls into most of them. Today I want to talk about one of my favorite apps I use when it comes to investing. 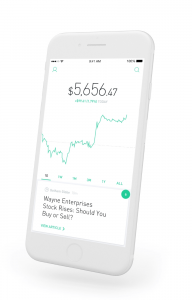 Robinhood is a free trading app that’s ideal for all investors who want to purchase a wide selection of stocks, EFTSs, and options without being charged any fees or commission. It generally acts as a brokerage with the aim of bringing stock investors to a wider audience. Robinhood platform has been a phone brokerage with both iPhone and Android apps as the key methods of logging into your account and placing trades. Currently, Robinhood platform has more than 5 million users. The year 2018 has been a great time for this platform since the company has been able to expand its web version, create its Options Trading service and also rolling out Robinhood Crypto which assists one in trading some popular cyber currencies. Scheduled deposits- It’s possible to schedule automatic transfers quarterly, monthly, biweekly or weekly. Advanced order support- This platform supports market orders, stop orders, limit orders, and stop limit orders. Instant access to funds- This platform allows instant access to deposits and mostly under $1,000 and also funds after selling stock. One doesn’t have to wait for the typical three business days. Day-Trade Tracking- although most people don’t prefer day trading, this platform helps the few who prefer day trading in tracking up to 3 trades in a rolling 5 day period. Robinhood Gold- It’s a new feature that has introduced after-hours trading, line of credit and huge instant deposits. Options trading- This is another new feature that allows one trade options without any commission or fees. Cryptocurrency trading- The platform now allows individuals to invest in Bitcoin, Ethereum, Litecoin, Dogecoin, Bitcoin cash, and Ethereum Classic. Robinhood accounts can only be opened by the US and Australian citizens. However, the company has plans to expand its services to Europe and other continents. For a standard Robinhood account, there’s no minimum deposit. However, if you upgrade to Robinhood Gold, then you have to deposit a minimum of $2,000. After signing up, you automatically open a Robinhood Standard account. After, you can upgrade your account to Robinhood Gold or downgrade to Cash account. The only difference in these accounts is the day trading limitation i.e. buying and selling stocks the same day. At Robinhood Gold and Robinhood Standard accounts, only 3-day trades per week are allowed. If you exceed, your account becomes blocked for 90 days unless your account holds at least $25,000. The cash account isn’t limited meaning that you can make as many day trades as possible without any minimum account balance. The process of opening a Robinhood account is fully digital, user-friendly, and fast. To submit the application, it only takes around 10 minutes and less than a day for verification. You must have a legal US residential address. You must be a US citizen, US permanent resident or possess a valid US visa. 1. Provide your personal information like date of birth, address, social security number among others. 2. Next, answer some short questions that relate to your trading experience. 3. Verify your identity with a passport, identity card or driving license. It’s very convenient since you can take pictures of the document with your phone. 1. Easy to use- The platform is user-friendly and easy to sign up and make trades. 2. Free trades- Zero, nada, zip, zilch, naught for any trade. 3. Options trading- there are numerous Options available at no cost. 5. No-Fee ACH Transfers- No charges on ACH transfers to and from an investor’s account. 1. Poor customer service- Availability of many negative Robinhood reviews on other shows that their customer service is poor. 2. Limited functionality- The platform lacks complex trading options which omit most advanced traders. 3. No retirement accounts- Currently, there are only individual taxable accounts. Custodial and joint accounts aren’t available. 4. Potentially Delayed Data- In some instances, Quote data can be delayed for even more than 20 minutes. 5. No mutual bonds or funds. In conclusion, investors who are looking for a low-cost way of trading stocks should consider Robinhood app. Pay Off Your Student Loans Early Or Invest?